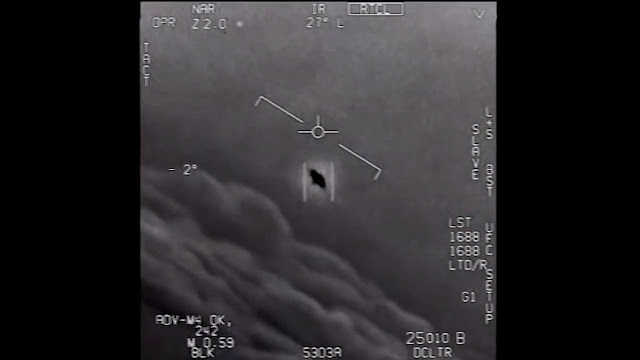 Have you been having fun watching the current UFO news blitz since it was kicked off by the now-famous New York Times article co-written by Leslie Kean? I know I have! Half the fun for me has come from monitoring the chatter between UFO people, following along with their thoughts on the news and trying to square the flood of information with what they (we) think or thought we knew not just about UFOs but about our government's response to the phenomenon. One of the two "Nimitz videos"
I'm in the middle of a great correspondence with UFO scholar and blogger at https://ufopast.com/ Professor Greg Eghigian about the UFO story that won't die, and I thought I'd share some of our talk here on High Strangeness. Greg directed me to a story he just penned for the Smithsonian Air & Space Magazine that you can read here, and he told me that he is, like many of us I think, approaching the news cautiously... In other words, he finds it interesting but he has a lot of questions. I'm having a hard time sorting it all out. On the one hand, I'm happy that UFOs are now headline news in the mainstream media, and that the story does not seem to be dying out. Hell, even Neil deGrasse Tyson is sounding a little on guard and off balance these days. On the other hand, I'm disappointed that most "experts" and commentators have had the classic knee-jerk reaction of going directly to the extraterrestrial alien spacecraft hypothesis to explain what's going on. That's not the only possible explanation, simply the easiest and most acceptable (relatively speaking). This doesn't really seem to be a case of the Pentagon discovering incontrovertible proof that we are being visited by aliens from other worlds. Rather, it seems more like a somewhat deniable admission that the military has been keeping its eyes open, and has seen some inexplicable things as a result, which is hardly "Disclosure," and hardly shocking. I find the Nimitz videos more confusing than confirming. Why does one pilot say, "There's a whole fleet of them" when only one object is visible? Why does the object shake and wobble in unison with the body of the camera, as if locked to the camera? Why does it never grow closer, or recede? And the list of people involved is insane.... Robert Bigelow? Tom DeLonge? Harry Reid? Leslie Kean? How do we make sense of that list of players?? I made the point on tv last week that Bigelow had a similar partnership with MUFON around the same time frame as the Pentagon study, and that in his deal with MUFON he would get to keep any artifacts or technologies recovered from their UFO investigations. Did he have the same deal with Reid? (and did he use some of Reid's $22 earmark to pay off MUFON?) Again, this approach to the story presupposes that they're dealing with "nuts-and-bolts" technology, and that the UFOs are manufactured objects. Where's the proof of that? It also seems to me that the story in its entirety is being very carefully and very professionally managed. I have no idea who might be doing this or why, but my gut tells me that this may the most important aspect of the story, as we know it thus far. 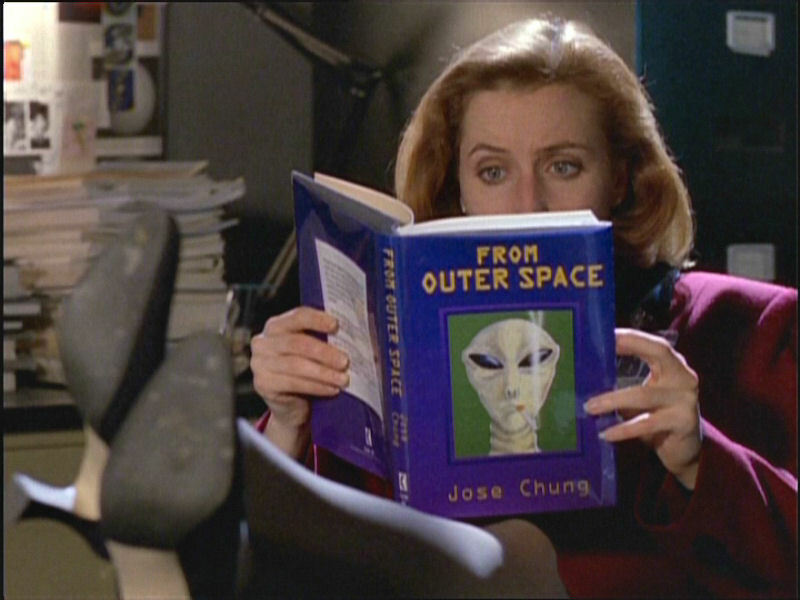 Maybe it's Fox's way of publicizing the upcoming return of The X-Files! Could it all be smoke and mirrors?? Now, readers, what's your take? 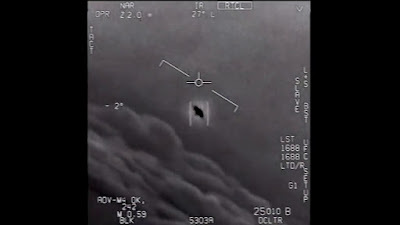 By now most of the world has heard of the top secret $22 million Pentagon UFO study revealed in the December 16 New York Times, and I'm sure a lot of us are scratching our heads over the article and asking a lot of questions about this so-called "Advanced Aviation Threat Identification Program," or AATIP. If, as the report states, the bulk of the $22 million AATIP budget went to billionaire aerospace entrepreneur Robert Bigelow to construct buildings in which to store captured alien technology, does that mean that Bigelow retained the right to keep whatever technologies or artifacts might be discovered/recovered by the program? Remember that when Bigelow struck a deal with MUFON around this same timeframe, he insisted that any physical evidence of a "nuts and bolts" object recovered by the MUFON STAR Team would belong to him. Was the supposed shutdown of AATIP in 2012 due to a lack of results, a lack of money, or both? If the mission of AATIP was/is to determine whether UFOs pose an "Advanced Aviation Threat," doesn't that presuppose that UFOs are real and are intelligently controlled physical objects? On what basis would AATIP have decided this? What has this "whistleblower" Luiz Elizondo, who claims to have been in charge of AATIP from 2007 to 2012, been doing for the past five years? Why release this bombshell news now when he could have done it in, say, 2012, when the project was defunded? U.S. Senator Harry Reid claims that AATIP is one of his proudest accomplishments, which implies that the program produced results, so exactly what results does he think it produced? If you listen to today's Times podcast about this story, reporter Helene Cooper says at about the 11:35 mark that "...the people who operate (AATIP) tend to be true believers," but we know from the fate of the Air Force's Project Sign in the late 1940s that when "true believers" are running a UFO research program the results and conclusions are going to be skewed towards the extraterrestrial hypothesis and ultimately rejected by the Pentagon brass. Did the AATIP meet this same fate? And if so, can its conclusions be trusted? I'm not dissing the reporting at all. There could very well be something very big and exciting going on here. But I think it behooves us to keep asking questions and demanding answers. Regular readers of High Strangeness may have noticed that my blogging has been sparse of late. There are several reasons for that. 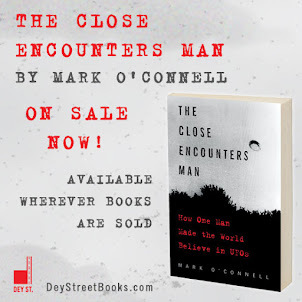 Even six months after the release of my book, The Close Encounters Man: How One Man Made the World Believe in UFOs, I still often find myself needing to just take a step back from UFO world and decompress. It's hard to explain how focusing on one singular topic for five + years can affect your feelings about that topic. Not that I've lost interest at all, I just need to limit my exposure to it sometimes, for my own mental health. And although this may sound contradictory, I'm more inclined these days to put my UFO energy into other media projects building off the success of my book. I've been working with a new manager, and I'm loving the energy she's bringing to my writing career. The projects themselves are pretty top secret, so I can't say anything more about them, but they are sure to be entertaining -- at least to me! Another thing: for the past 2 years I've been teaching screenwriting as an adjunct professor at DePaul University and I really love it. My students are so talented and so positive, and I'm privileged and honored to help them find their voices and become better writers -- which I'd like to I think I've become fairly good at. So, this fall I've also been devoting a lot of energy to applying for full-time teaching posts. I don't have a Masters of Fine Arts (MFA) or a Ph.D., which puts me out of the running for many faculty positions, but every now and then a college is willing to waive that requirement if you have what they call "equivalent professional experience." Fortunately for me, my Star Trek writing experience and the publication of my book qualify, so when I find one of those opportunities I have to pounce on it. I keep getting emails from Tom Delong's insipid "To the Stars Institute" or whatever the hell it's called, urging me to do my Christmas shopping at his website. So apparently his UFO Institute is just an e-commerce operation, nothing more. 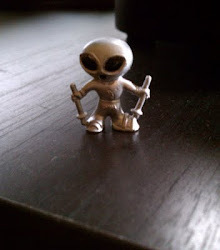 No, he is not getting a penny of my Christmas $$, and neither is MUFON, come to think of it. Someone on Facebook recently pointed out that the upcoming International UFO Congress is featuring a talk by Don Schmitt on whether Dr. J. Allen Hynek had "discovered the truth about UFOs." Anybody who knows anything about Dr. Hynek knows that Hynek would have despised any suggestion that he might know the "truth" about UFOs. All I ask is that, if you plan to go to this lecture, please read my book first and then make up your own mind. And if you don't want to buy my book, for God's sake check it out of the library! I recently saw on IMDB that the producers of the History Channel's "Blue Book" TV series have cast someone to play "General Hoyt S. Vandenberg." This made me chuckle and roll my eyes. Why they think this is worth noting is beyond me. Vandenberg's involvement with the Air Force's UFO study lasted about three seconds -- just long enough for him to reject Project Sign's extraterrestrial hypothesis-friendly "Estimate of the Situation," all (or perhaps almost all?) copies of which ended up being destroyed as a result. Does this casting notice indicate that General Vandenberg has been posthumously promoted?